.. i would choose the bottom ones! This entry was posted in web world and tagged attraction, funny, pick two, relationships. Bookmark the permalink. .. hi mr. black, very meaningful first posts you got in your blog. after all, intelligence comes from daily experiences eh. .. hello chyng! love your travel blog posts! will add your blog to my peekaboo list. won’t mind emotionally disturbed. lol! .. i can’t choose the same as yours gelo – i’m already disturbed! tough one. 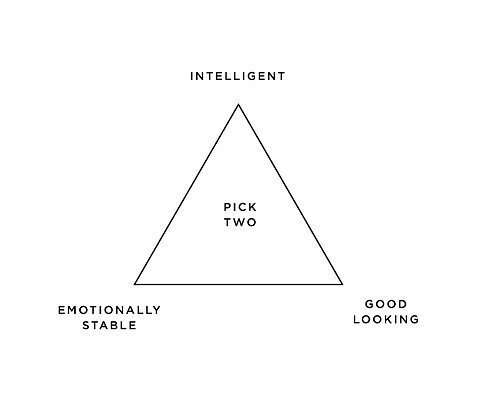 but i think id settle for good looking and stable. being intelligent doesn’t appear to guarantee elusive happiness. .. yeah max, no guarantees!